Sale-a-brate with the Stampin’ Addicts! Sale-a-brate with the Stampin’ Addicts! published on January 28, 2011 Read more posts by the author of Sale-a-brate with the Stampin’ Addicts!, Jentimko29 Comments on Sale-a-brate with the Stampin’ Addicts! 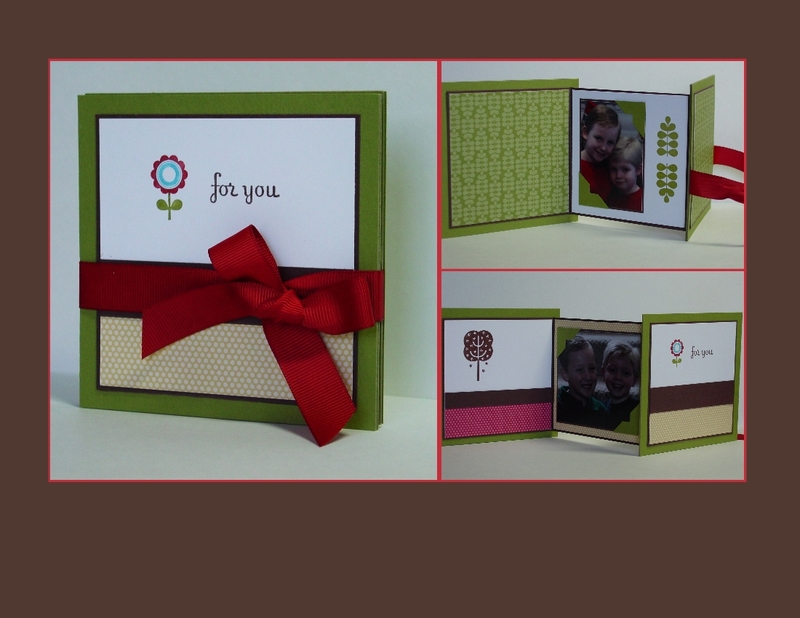 Welcome to the Stampin’ Addicts Sale-a-bration Blog Hop!! I hope you are enjoying the projects you can make with all the FREE stamps available with the SAB promotion. 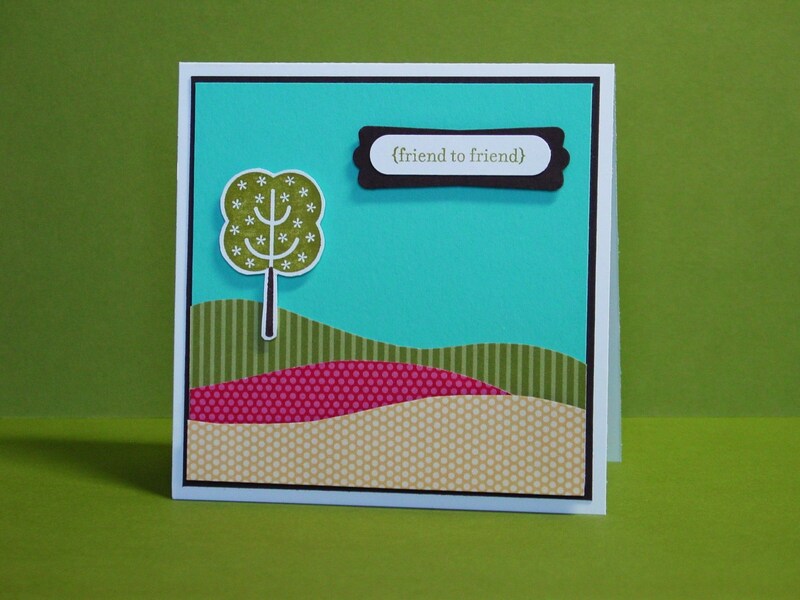 I know you loved Holly’s projects over at InkPaperStamps with Forest Friends! She always has the best ideas. I am going to show you some things I made with Funky Four. Talk about a fun set!! It is part of the “Family Organization Suite” and has matching designer paper called Play Date. I have used that on a couple of things today because, let’s face it, they are made for each other! FYI, you can click on any picture to see it in more detail. 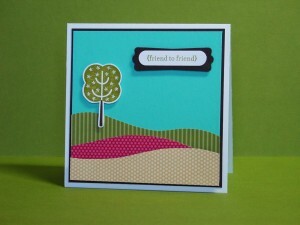 My first project is a quick card that uses the designer paper to create grass. Ok, alternate universe grass but the bright colors are really perfect! I just used my paper snips to create the hills using Play Date DSP and the Brights Paper Stack DSP. I inked up the tree in Old Olive and Early Espresso, stamped on Whisper White and cut it out. 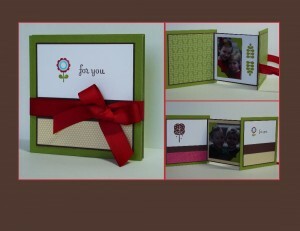 The sentiment comes from Teeny Tiny wishes and the punches (Word Window, Modern Label) are perfect for that set. The sentiment, the tree and the yellow “grass” are all popped up on Dimensionals. I’ll admit that the next card is for someone of a certain sense of humor. I certainly did not originate the idea with the mushrooms but I find it really funny! The psychedelic rick-rack paper comes from the Greenhouse Gala DSP. I used my markers to color the mushrooms and sentiment is from Party Hearty. I created a bow with my Pumkin Pie Narrow Grosgrain and cinched it up with thread through a Brights Button. The sketch comes from Mary-Jo Price and is perfect for these little mushrooms! Since I am limited on the number of pictures for the hop, I created a collage of my last project using My Digital Studio. This is a mini photo book that uses a variation of a tutorial from Sarah Wills (she is stop number 5 on this hop, by the way). I will give more specifics on my variation, plus a link to her instructions, on Monday. I’m so glad you stopped by today and that you like these fun projects! Your next stop on the hop is Holly at Rubber Redneck. You will be so impressed with what she made using Ornate Blossom! Thanks for hopping with me today. I look forward to seeing you again soon! Really, cute card. I love your “clean” style! What fun projects, Jen–and I love how you used MDS to make a collage so we could see your mini photo book in all its glory (and in a nutshell)! I just love your projects….especially the photo book..thanks! OK, this is one of my favorite stamp sets, so my standards are pretty high. And you did a fantastic job with it!!! Great projects! I love the colorful hills on the first card – so cute! Fabulous projects! Your mini photo book is super cute!! Love your projects! I need to get my Funky Four out and play with it some more now! 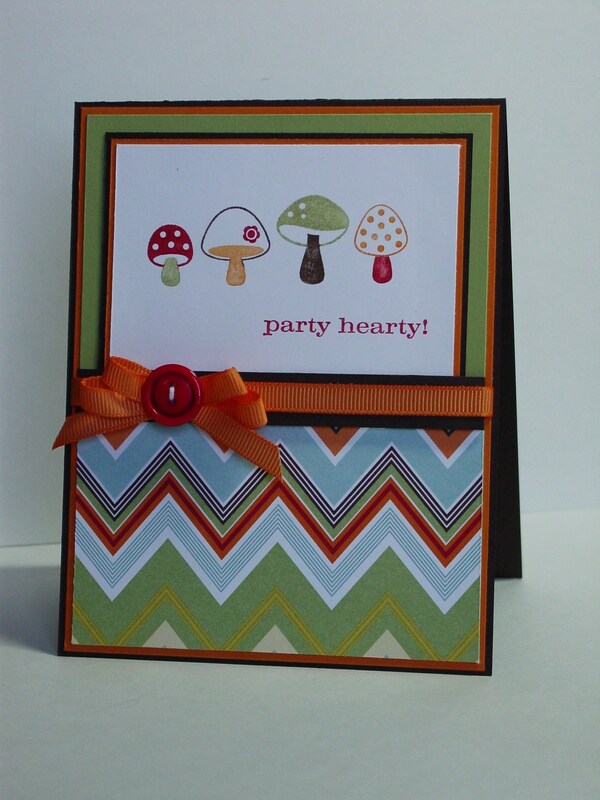 Okay, I got a giggle out of your Party Hearty with mushrooms card. WHAT were you thinking?! *grin* Love the bow on it, too (no surprise there, ‘eh?). All fabulous projects, Jennifer! I am not a fan of funky four but boy you changed my mind!! Adorable projects! Cute cards, love this stamp set. I just got this set today – love what you did with it! Love what you did! The rolling hills card and the mushroom card are really adorable! Great job! I love how you used different color (ie pink!) paper for the hills in your first card, Jen! Very impressive array of projects! Makes me love this set all the more. Great job Jen, as usual 🙂 Love the mushroom idea and the mini book is too fun!! Such cute cards. I love the mini book. Great grandparent gift. Fabulous job Jennifer!! Love that first card. The funt cheerful colors ar just what I needed to brighten up my fog filled day. I’ll have to add this set to my SAB wish list!! Such pretty projects Jen! I especially love the tree landscape! I ‘love’ your clean style too. Sometimes simple is better. 🙂 PRETTY. Very cute projects! It never occurred to me to use anything other than green grass, but I love it! Wonderful projects Jennifer. Love the sly mushroom reference too – lol. My fav is the mini album and I loved the way you used MDS to expand the limitations. Thanks for sharing and joining the hop. 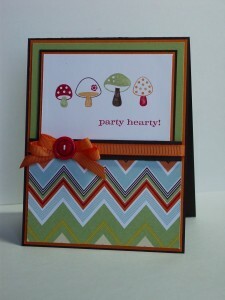 Jen, I love the clean and crisp look of your projects, Gotta love that mushroom card! Super job! Great job and now I really want that set!!! lol Way too cute all of them! I love all of your projects Jen, and your Clean and Simple style. Cute projects. You made that stamp set look really good. Great job! I too think the mushroom card is funny. All of your projects are wonderful, I love the photo book. Thanks so much for playing along with my sketch challenge this week!